Sometimes getting ready can be fun, but most days, getting ready just needs to get done. The more efficient we can make our makeup and hair routines, the better. Why not try a hair straightening brush to cut down on your hair routine? Using a brush straightener detangles, brushes, and straightens your hair, reducing the amount of time it takes to get ready. And, a brush that also straightens hair is not only more efficient, it’s also great for traveling. The next time you pack your bag, lighten your load with this two-in-one device. You’re probably wondering which one is the best in terms of heat, speed, safety, and price. We’ve researched the top-rated, best-reviewed, and best-designed electric hair straightening brushes on the market to help you find the one for you. 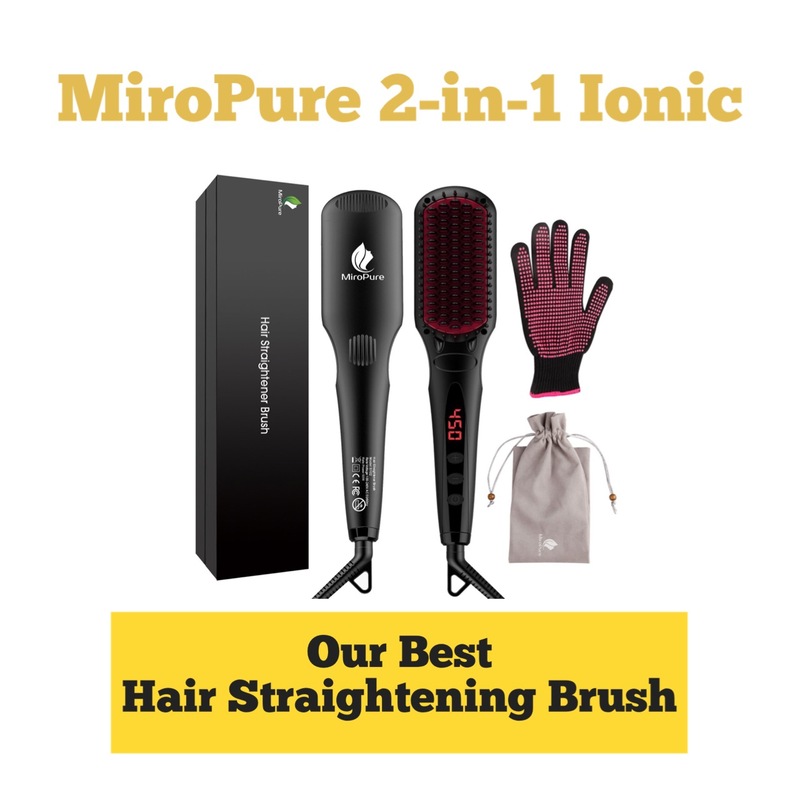 The 2-in-1 Ionic MiroPure straightener took the concept of the electric brush to the next level. It has all the possible features, including detangling anion hair care, massaging nano-bristles, automatic shut-off, and temperature lock functions for safer use. It is a bit pricey, however, there are tons of rave reviews about this product online, so let’s see if it’s worth the money. MiroPure’s packaging is incredibly classy and professional and includes a heat glove and a cute carrying case. It comes in two color combos—black with red bristles, or pink gold with black bristles. Heating: MiroPure heats up in just 30 seconds, making it the fastest to heat up. It has 16 temperature levels — from 150°C (302 °F) to 230°C (446 °F) — so you can choose the right setting for your hair type and texture. This brush is one of the safest on the market with its 60 minute auto shut-off feature, as well as the temperature lock setting that helps to avoid accidental temperature changes. Material and design: The all-plastic brush features metal ceramic heating surface for even heating. The modern design includes anti-scald bristles that allow you to comb all hair strands from roots to tips without tangling. This design, although very effective, becomes a disadvantage with cleaning the brush. The high density of bristles makes it hard to clean. However, you might overlook that when you benefit from the built-in ionizer that helps smooth hair and tame frizziness. Using: MiroPure features a rotating cord for flexibility when using, three buttons—on/off, plus (+), and minus (-)—and 16 different temperature settings to get the perfect heat for your hair type. Voltage: Fortunately, this brush is dual-voltage (110V-220V) and fits rosettes all over the world. You can take MiroPure on your next vacation abroad without an adapter. Yes, the MiroPure straightening brush is completely worth the money. And better yet, it’s always on sale. I would definitely recommend this device for everyday hair styling and even for special occasions. It also makes a great gift, because the packaging looks really solid and much more expensive than its actual price. Tip: Move the brush more slowly through your tresses for a better straightening effect. We all dream about the fast and easy morning hair routine. And it seems that our prayers have been answered. Only a small number of straightening brushes has so many benefits as the Miss Queen’s! Its main aim is to get you rid of frizziness and show that your curls and kinks may transform into perfectly straight locks in 5 minutes (15 for extra thick manes). The Miss Queen’s hot hair straightening brush works not only for all hair textures, but also for different hair lengths. The brush`s head is 2.5”x5”. As long as your hair has enough length to run the brush through, you may use it. Heating: Heats up to its maximum temperature (450°F) in 30 seconds. If you push one of the control buttons, you higher or lower the temperature by 5 degrees. So, it is possible to choose a temperature setting for every hair type, starting from the thickest and kinkiest locks (446°F), and ending with the finest or very damaged hair (302°F). To lock the chosen temperature, just hold the + and – buttons for 3 seconds. Material and design: The brush is equipped with a double ionic generator, so hair becomes twice as smooth, frizz-free and manageable. Bristles are ceramic, but not very hard. They provide gentle brushing and a pleasant scalp massage. The brush itself is cute and ergonomic. Its head has a specially designed shape. Thanks to it the teeth don’t scratch the scalp, don’t pull out hairs and don’t burn the skin. The Miss Queen’s packaging includes a straightening brush in a gift box, a minimalistic carrying case, a manual, and a small cleaning brush. Using: The brush has a 360° rotatable cord (6.5 ft. long), an LCD display, two temperature adjustment buttons (+ and -), and one on/off button. Must be used on dry hair only! Also, wipe the brush with a damp rag each time after using it to keep it clean, and it will serve you for ages. Voltage: The Miss Queen’s brush is dual-voltage (110V-220V), which means you may use it all around the world without a special adapter. Miss Queen’s hair straightening brush gives a result of natural-looking smooth and silky locks. The same as your fave flat iron, but without the heat damage. As you’ve seen in the pros/cons chart, the brush has a lot of benefits. It deserves to be in a wish-list of every woman who has unruly curly hair, or any other texture, but suffers from frizziness and puffiness. A lot of reviewers call it the best straightening brush in this price range. AsaVea’s strange shape and hyped status may put some people off, however, I was glad to be able to try this brush out. The shape distinguishes it from other brushes, but if it works, then who cares if it looks different. This brush professionally straightens all types of hair and has a good anti-frizz feature. It’s available in two colors, tender pink and red, with a dark gray base. This brush handles well, is lightweight at 1.3 pounds, and pretty. Heating: The AsaVea brush heats up in only 90 seconds, achieves a maximum temperature of 200°C (390 °F), and has 6 different temperature settings. It includes a 30 minute auto shut-off feature, convenient for busy mornings. Material and design: This brush is made of ceramic, silicone, and plastic elements making it both efficient and lightweight. The area with bristles is narrower than other brush straighteners, being specially shaped for more constant and even heating. AsaVea’s sleek and futuristic design is something you need to get used to. Using: It’s as simple as turning on the power button and adjusting the temperature settings. You can keep track of temperature with a gradation meter above the buttons, however, you can’t switch Fahrenheit to Centigrade. You’ll need to find your optimal speed for combing through strands for best results. If your hair is thick or curly, slow down and let the steam work its magic. The 360 degree rotating cord makes this process easier and more comfortable. Voltage: AsaVea is only 110V. It’s recommended to use it on 110V-120V. If you travel abroad, you probably have to buy an adapter. At first, I was skeptical, but it took me 5 minutes to fall in love with this device. I love its portable size, futuristic shape, and the way it combs through my hair making every strand straight and smooth. Sometimes I had to slow down and part my hair into smaller sections for better straightening, but, in general, the process was pleasant. I would recommend buying this device, especially since it is usually on sale on Amazon. At a more modest price, the Apalus could be the best hair thermal straightening brush you ever use. The price point is three times less than the Dafni brush, making it more affordable to try out. It comes in two colors, pink or black. It is an attractive and reliable brush, with a 12-month product warranty. A cute, velvet carrying case for traveling will help you save precious time and look gorgeous on-the-go. Heating: This pretty and lightweight pale pink brush maintains a constant heat throughout the entire brushing and straightening process. The temperature is customizable up to 230°C (450 °F) to suit your hair type, however, the bristle tips max out at 125°C (257 °F) to guarantee your safety. It reaches salon temperature in just a couple of minutes, and after 60 minutes, it will shut off automatically, so you never have to worry when you leave the house. Material and design: The Apalus brush is made of ceramic to maintain a constant, high temperature during the straightening process. The special massaging bristles feel really good on your scalp. Using: The 360 degree rotating, anti-winding cord makes Apalus brush flexible to use. It also has an LCD temperature display and 3 buttons: on/off, heat up (+), and heat down (-). If you press plus (+) and minus (-) at the same time, it will display either Fahrenheit or Centigrade. When you turn it on, you have to wait 2 to 3 minutes until it gets hot, but the straightening process very smooth and fast. Voltage: Apalus straightening brush supports 110 to 240 Volts. If you travel abroad, you need an adapter, which is not included in standard set. The Apalus hair straightening brush works well and fully justifies its modest price. I tried it on my medium-thick hair and the effect lasted almost all day—the weather was humid. There are reports that it does not work as well on naturally curly hair, but with the adjustable heat settings and the low cost, why not try it out? As for me, I’m ready to use the Apalus brush for casual, everyday styling. The FemJolie is one of the best-selling electronic brushes, so rest assured that tons of gals have tried this one and fallen in love. This brush is known for getting hair silky-smooth with its anti-static technology and professional heated steam. There are 3 color options, pink, white, and black. The packaging is modest, but the brush itself looks stylish and reminds me of salon-quality hair tools. It’s a great solution for casual styling for all hair types. Heating: The temperature is customizable up to 230°C (450°F) to suit your hair type. Use a lower temperature for fine hair and maximum of 450°F for curly and thick hair. Temperature gauge is visible on a small LCD screen. The brush shuts off automatically, so you don’t have to worry when running late in the morning. It also has a special anti-scald design to protect your hair, hands, and shoulders from burning. Material and design: FemJolie’s body and bristles are made of a biodegradable plastic, making it lightweight and eco-friendly. The heating surface is made of ceramic for constant heating and fast recovery. What really sets the FemJolie brush apart are its massaging silicone bristles that stimulate hair growth. The brand is proud of this 4-in-1 design—a brush, a straightener, a detangling comb, and a hair massager. Using: Just press the on/off button and it’s ready to work. Adjust the temperature settings or switch from Fahrenheit to Centigrade using the plus (+) and minus (-) buttons on the side. The FemJolie brush has a 360 degree rotating cord and a hanging hook, which makes this device flexible and easy to use. One tip: Run this brush through your hair more slowly for better results. Voltage: This brush was designed for 110 to 240 Volts. You can travel worldwide without worrying about adapters. Consider the FemJolie hair straightening brush when you need a wow-effect. It straightens hair of all types and lengths with no frizz or annoying curling at the ends. This brush may be pricey but you can usually find it on sale. If you buy from Amazon and you’re not satisfied, return it in 60 days, guaranteed. The USpicy straightener is sure to give you smooth and straight tresses. It has a variety of bristle sizes in an alternating pattern for maximum heat coverage, making it perfect for thick, curly, unruly, and long hair. The USpicy brush has all of the most important features. The stylish packaging includes an extra-long cable, a storage case, a little brush for cleaning your device, and a protective heat glove. The brush itself looks sleek and modern with elegant, gold buttons. Heating: The plate can heat up to 230°C (450°F), and comes with 7 temperature levels and a 30 minute automatic shut-off feature. Thanks to the special anti-scald design, it’s always cool to the touch. The heat glove is for the other hand when handling hot strands of hair. Material and Design: USpicy’s oval brush measures 11 inches, and features ceramic heating plates for constant heat. The body and bristles are made of solid plastic, however, there is one design flaw. The bristles in the middle of the heating surface are very thick and don’t appear to be able to straighten very short hair. Using: USpicy is lightweight and easy to handle during the straightening process. Its cord rotates 360 degrees, which makes it flexible to use. Adjusting the heating settings is simple and easy. Voltage: USpicy works for 110-240V, which makes it travel-friendly. No need for an adapter. The USpicy hair straightening brush is one of the best straightening devices in its price point. It looks stylish and professional and it has a powerful steam setting that would work for all hair types. The best part of this brush is that it has the most thought-out standard packaging that includes a heat-protectant glove, a cleaning brush, and carrying case. The little things can make a big difference when deciding which brush to buy. The Dafni was the first hair straightening brush to ever hit the market. It’s a little expensive, but it’s a reliable brand. It was created in 2012 by 24-year-old Sharon Rabi and her senior electrical engineer father, Kobi, in their family’s basement. The video featuring Dafni’s straightening super-powers gained more than 85 million views on Facebook. The brush is ceramic, nice-looking, no frills, perfect for those who like simple, hard-working items. The packaging is cute and stylish making the Dafni brush pleasant to receive or give as a gift. Heating: The Dafni ceramic brush heats up in just one minute. Automatic shut-off is not available, so you’ll have to be extra-cautious to turn it off when using this device. There are no individually selected temperature settings, which can be a problem for those who like to customize everything. However, the heat setting of 185°C (365°F) was carefully calculated to ensure the perfect temperature for salon-quality straightening without damaging your hair. You can control the intensity of the heat with the movement of the brush to go from slightly smooth to perfectly straight hair. Material and design: Ceramic construction ensures an even heat. Dafni bristles have specially patented, 3D geometry to provide multiple contact points with your hair for faster results. The anti-scald design reduces chances of accidental burns. Using: The standard design does not come with a hanging hook or rotating cord, which is slightly inconvenient. If you get the rotating cord, it rotates a full 360 degrees, making styling easier and suitable for all hair types. The cord is 2.2 metres long for easy maneuvering. Voltage: The Dafni brush was created for 110/120 volts AC at 60 hertz. If you travel abroad, you will probably need an adapter. The Dafni hair straightening ceramic brush is a hard-working one. Of course, if you’re the lucky owner of super-thick and curly hair, you’ll have to spend more time in front of the mirror and the effects might not last as long. There’s no magic, just a good product that’s worth the money. It’s perfect for everyday styling and traveling, and this brush can guarantee almost salon-quality smoothness and sleekness. This rotating air brush is for women who ask, “Why can’t I use a straightening brush on wet hair?” The BaBylissPRO Nano Titanium works both as a professional round brush and a hairdryer. Moreover, it smooths the hair out, like a decent flat iron, and gives a good, bouncy blowout. Every detail of this air brush model is thought out and I am excited to try this device. Heating: The BabylissPRO Nano Titanium has a metal barrel and holds heat like a professional curling iron, but at the same time its ionic technology is much healthier for your hair than all possible hot devices. Due to negatively charged ions, you don’t lose natural moisture and shine contained in the hair’s cuticles. This is especially important if your hair is damaged or chemically processed and tends to become dry and dull after using hot tools. This brush has 3 temperature and rotation modes (low, high and cool), so you can easily adjust heat and speed settings for your hair type, length and preferences. Material and design: The first thing I noticed about the BaBylissPRO Nano Titanium air brush is that it is pretty big and doesn’t look like a travel-friendly tool. Be ready to get a 14 x 2 x 6 inches and 14,1 ounces rotating device and learn how to use it properly, though BaBylissPRO’s design is super cute and user-friendly from the first try. The packaging looks presentable and stylish, which makes it a perfect gift. Using: For best results, start with towel-dry or slightly damp hair, apply a heat protectant spray or oil and comb through the tangles. When you’re ready, choose the mode you want (cool, high or low) and start. Be sure to separate smaller sections of hair to avoid tangles and make the blowout more voluminous and professional. Maybe you will need some time to master this skill, but it is totally worth it. Check out this video tutorial. Voltage: For international trips, you will need to buy a power transformer. Having considered all pros and cons, I am still sure that the BaByliss Pro Nano Titanium rotating air brush is absolutely worth trying and buying, especially if you love good blowouts and want to lift fine, flat and limp hair. It will work wonders together with a professional hair volumizer and a pair of skillful hands. You really can achieve salon quality results in 10 minutes or so! Looking for a multifunctional device that can dry and curl or straighten your hair depending on your mood? InStyler will do it for you and as a bonus it will add volume and shine, if you master the art of using this tricky tool. I’m gonna share my first impression, explain all the tips and tricks and actually try out one of the most popular of InStyler’s devices. Heating: InStyler Wet to Dry has 3 different temperature settings. Use low mode for fine, thin hair and higher temperatures (maximum 410°F) for thick, curly and/or natural hair types. Due to its auto shut-off feature, this device is safe because it turns itself off automatically after a couple of minutes of no use. Material and design: InStyler Wet to Dry is stylish and visually appealing. Its packaging is absolutely satisfying because it looks professional and has a cute carrying case inside. The device itself is white with little, purple patches of color. It has a curved tourmaline ceramic floating plate and a titanium 1-1/4 inch barrel , so it holds heat without burning your fingers. Using: The instruction inside titled “Top four things you need to know about your InStyler Wet to Dry Rotating Iron” says you need to towel-dry your hair first. Then you need to process each hair strand according to the “once to dry and once to style” formula, which means you should glide through each strand twice. InStyler will do its best if you go slowly and process smaller amounts of hair. And the last rule is to listen to the crackle. Crackling means the moisture is evaporating properly from the barrel and not in your hair. It feels a bit weird using Wet to Dry for the first time, but then you get used to it because the technology is absolutely safe and life-changing! Check out this YouTube tutorial to see the whole process. Voltage: InStyler uses a regular 110V outlet and it needs an adapter for other voltages if you frequently travel abroad. InStyler Wet to Dry Rotating Iron was created to save precious time in the mornings. It can replace such styling tools as a hairdryer, flat iron and curling wand, which definitely sounds like a good investment. Probably, the most disappointing fact about this device is that I can’t use it for extra wet hair right after the shower, but I managed to organize my morning routine to fix this bug (I simply have my breakfast while my hair is getting towel-dried). This futuristic tool from Joiella actually combines the best features of a flat iron and straightening brush. It’s perfect for short and medium lengths and thin, fine or wavy textures. Due to its natural boar bristles and ceramic body, Joiella’s brush is not only worth its money but is powerful enough to replace all styling tools you use in your daily routine. It won’t straighten thick and curly hair and it shouldn’t. It just smooths the hair out, making it look. Heating: The lowest temperature is 290°F and I recommend leaving it at this point if your hair is very thin or damaged. Increase the temperature to 450°F carefully to avoid sharp swings or overheating. Material and design: Joiella’s hair straightening brush comes in a cute package with a heat protective glove, a protective pouch and 2 sheets of IM. Its high quality ceramic body and natural bristles look decent, though I don’t like Joiella’s very bright purple color, which makes it look cheap, though the LCD display, user-friendly buttons and the whole design really save the whole situation. Using: Long press “+” to turn this tool on. Then press “+” each time you want to increase 20 degrees at a time. For naturally smooth hair, you don’t have to section and clip your locks. Simply glide the Joiella Brush throughout the whole length to achieve that effortless look. If this is a special occasion, you can create a flip or straighten each strand more carefully. Also you can use Joiella with your regular leave-in conditioner, volumizing mousse and all other products that require heat to be activated. But never skip a heat protectant because even the lowest temperatures can be harmful to damaged and chemically processed hair. Voltage: This tool is dual voltage, so you can travel all around the world without buying an adapter. I absolutely recommend Joiella Hair Straightening Brush to women with fine, thin, normal and wavy hair to straighten, smooth and style their manes every morning. What I love the most about this tool is that it helps to distribute various hair care and styling products evenly and make them really powerful due to the brush’s natural boar bristles and heat. This brush doesn’t straighten thick hair like a flat iron, but it definitely will make all hair textures look better, smoother and shiny! Miuphro isn’t the most popular brand among Amazon’s best-selling hair straighteners, but this mini straightening brush has 96% positive reviews and 4.9 out of 5 stars, so it’s time to get to know Miuphro closer. Specializing in innovative hair tools, this Chinese brand is like Huawei among styling devices—not an iPhone, but works even better. Let’s talk about the little brush straightener that has impressed so many capricious reviewers! Heating: This brush has a few temperature settings, so I recommend 350°F for thin and fine hair or 410°F for normal and thick hair. Due to its special anti-scald design, plastic comb teeth surrounding the heating area, and auto shut-off feature, Miuphro is absolutely safe and reliable. But you still need to avoid pressing “ON/OFF” accidentally because the control button is situated right where you normally hold a brush. Material and design: Miuphro’s brush is very small (7.1*1.7*1.5 inch) and lightweight, though the heated area is big enough to straighten a whole head of thick and curly hair. It’s not much bigger than your iPhone, I swear, and this tiny tool fits all handbags. Moreover, I love Miuphro’s smart and elegant design and packaging. It looks much more expensive than it actually is and I would even give one as a present with no remorse! Using: Start with completely dry hair sprayed with a good heat protectant product. Comb through the whole length if you’re in hurry. Use a detangler if you find your mane difficult to glide through. You can also section and process through each hair strand separately to achieve smoother results. Voltage: This tool is dual voltage (110-220V), which makes it absolutely travel-friendly and easy because there’s no need to buy an adapter. Yes, yes and yes! The tiny Miuphro’s brush has totally impressed me too. I recommend this straightening tool for all hair types and lengths, on a daily basis and for special occasions. It is 100% easy to use and 200% effective. Hair remains smooth and bouncy till the end of the day, as if you visit your hair stylist every morning. Despite the fact that this brush works wonders, it is still a hot tool that can completely burn your hair if you forget about heat protection and like to fry your hair daily! This little monster is a decent professional hot tool, if you’re skilled enough to style your hair like a pro. But at the same time, this xtava’s Hotness 3-in-1 iron is revolutionary in its affordability, so you can buy it and get salon-like hairstyles each time you want to look fabulous. Okay, first things first, let me introduce this weird-looking 1-inch-plate iron and tell you how it manages to combine the properties of a round brush, curling wand and flat iron. I also wonder if it’s powerful enough to replace all of my regular styling tools! Heating: Even when the LCD display says the brush is ready to use, it still can get hotter and hotter. xtava gets hot over longer than 1 minute, as they say on the packaging. Moving on, this device has 4 different temperature settings: from low to high. Use lower temperatures for fine and flat hair and higher degrees for managing thick and curly locks. Thanks to its auto shut-off feature, the iron brush turns itself off automatically and you don’t need to call the fire department when running late in the morning. Material and design: The product comes in an elegant black box and with a convenient black protective pouch. All materials are high quality and pleasant to the touch. The device itself is made of ceramic and tourmaline. It has easy-to-operate parameters (12.5 x 2.1 x 2 inches) and a 360 degree rotating cord. Moreover, xtava Hotness 3-in-1 is visually appealing and looks very well thought out. Voltage: xtava Hotness 3-in-1 is dual voltage, so you don’t need an adapter when traveling abroad. The xtava Hotness 3-in-1 device is interesting and intriguing. It gives you a high quality multifunctional tool for an affordable price, but you really need to have two right hands to do everything properly. Read the manual, watch tutorials and be open to experiment! A quick tip: If you use a simple brush to follow your straightener while flat ironing, xtava changes the game. With this tool, you simply need to turn the device around and the bristles will comb through the section of hair you’re working on. To help you decide whether electric brushes are good for you, here are some of the most common questions I saw on blogs and forums. It’s an electric brush with a ceramic heating surface that straightens hair while combing. Some units have additional features like anti-frizz, massaging bristles, auto-lock, and auto shut-off. I chose the best models in this article to compare their functions, and the pros and cons. Why is an electric brush better than my flat iron? An electric hair brush is fast. It heats up in 30 to 90 seconds and straightens the whole head of hair in 3 to 10 minutes, depending on your hair type and texture. It’s much healthier for your hair due to lower temperatures and completely different straightening process. Especially if you prefer sleek hairstyles on a daily basis. Are there any special rules of using brush straighteners? Don’t use a hair straightening brush on wet hair. Comb your hair before using an electric brush for better straightening. If your device doesn’t have an auto shut-off feature, always turn it off after using. Does a hot rotating air brush straighten hair? An electric rotating airbrush can only smooth the hair or straighten fine, thin or slightly wavy locks. In all other words, a rotating air brush creates a bouncier, more voluminous blowout kind of look. How to make straightening healthier? ALWAYS use heat protectant hair products. This is the easiest way to make your hair routine safer for your hair when using your favorite hot tools. Here is a list of the best drugstore and salon heat protectants. Which temperatures would work on my hair? If your hair is very fine or bleached, choose brush models with different temperature settings to avoid unnecessary hair damage. Depending on your hair type and texture, you can easily straighten your hair with lower temperatures. Is it safe to use hair straightening brushes for children or teens? It can be safe to use under your supervision. Choose models with an anti-scald design, lower temperature settings, and heat-protectant products, such as heat gloves, to make the process even safer. Does the hair straightening last in humid weather? Your hair will behave similarly to when you use a flat iron. The effect will last longer in humid weather if you add anti-humidity hair products to your routine. All in all, I think hair straightening brush is the best thing that happened to hair styling industry in the last decade. These models are hands down the top 11 straighteners on the market today. Which one will you choose for the quickest and simplest way to completely style your hair in a matter of minutes?